I’m an apartment dweller, and this gutted out samsonite train case was in the laundry room…where we residents share our cast offs. I can’t tell you how many treasures I’ve both left and picked up there over the years. And this little red case I grabbed when I first saw it, then after two weeks sitting inside my front door, I ended up taking it back to where I found it. 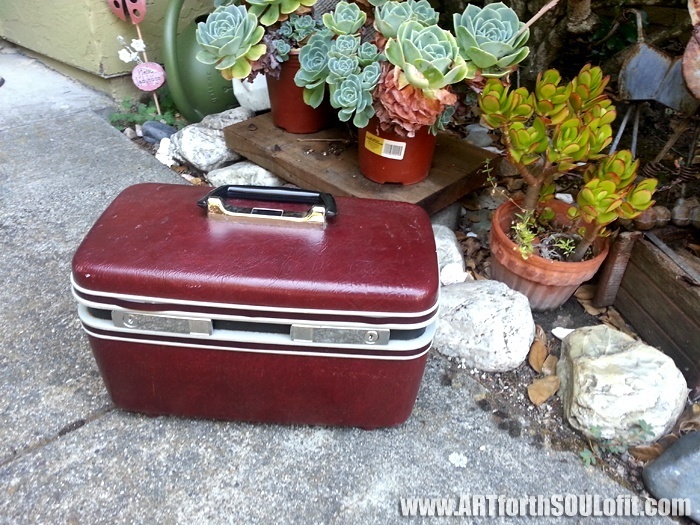 Then the next morning, after an email from an art pal inviting me for breakfast and some plein air, well…i ran back to the laundry room as quick as my legs would carry me and thankfully there she was…just waiting to be converted into my new travel container. Here she is stuffed full. Absolutely everything fit…I was stoked. That’s my cigar pochade box there, have you seen the video of how I put that together with no tools? Even my old workshirt is in there, cuz I make a mess with art supplies. 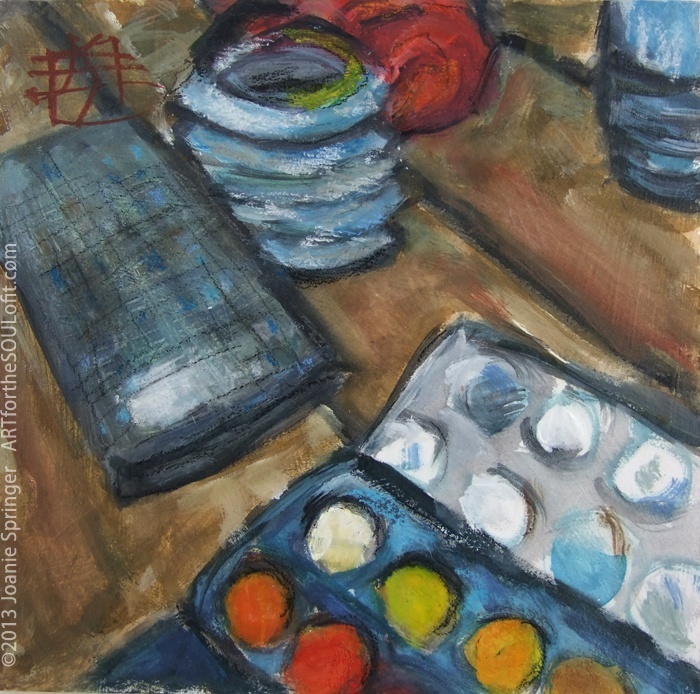 Since I’m using up older art supplies, I grabbed this set of opaque watercolors by Pelikan. They fit and I hadn’t touched them in a couple of years or more. Not as rich and yummy as my tube gouache, but they worked. And was nice to have all these colors at my disposal. 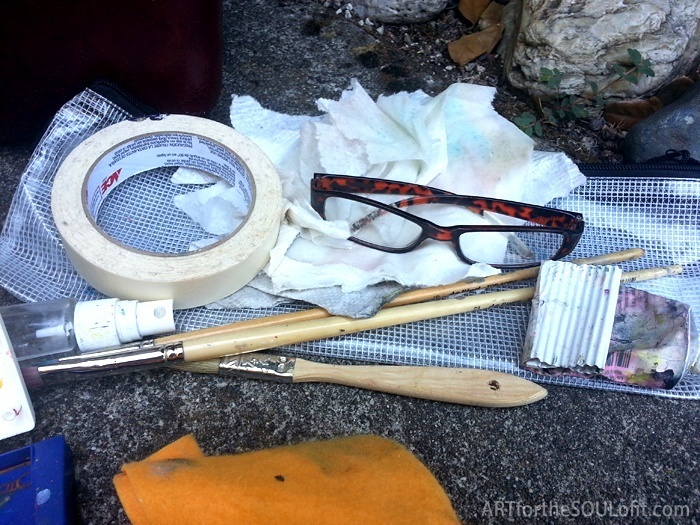 Let’s see, I successfully stuffed into this case my cigar pochade box, gouache pan paints, paper towels, washable cloth – cuts down on paper towel use, masking tape, collapsible water container, my glasses, white tube gouache, brushes, spray bottle and a big water container. Oh yeah, my workshirt. Not bad, eh? All stuffed in my newly upcycled Samsonite train case? Here’s a close up of more of my stuff. 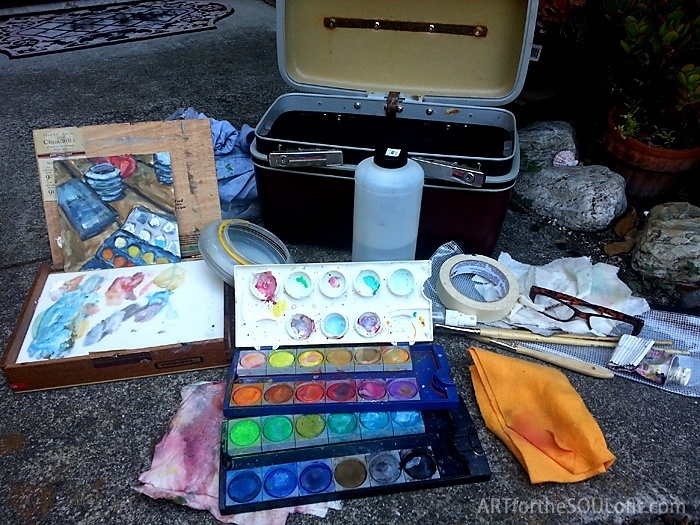 A closer look at some of my art supplies. 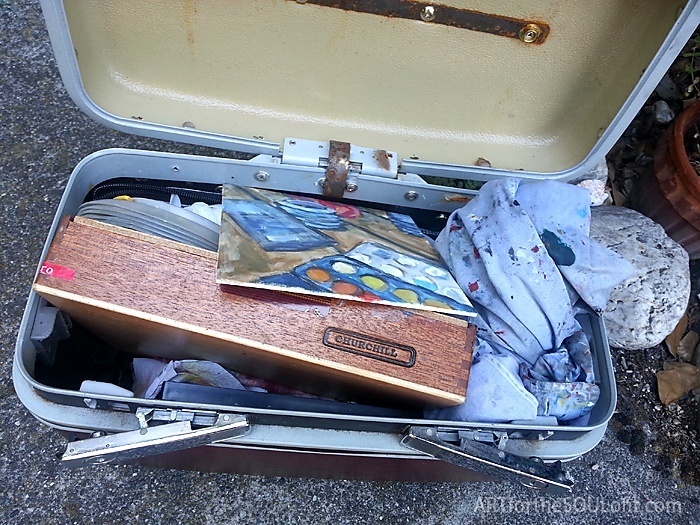 My new train case is so handy to carry, and I even had my wood 6 x inch hardboard support ready to tape down to my pochade which you’ll see next. 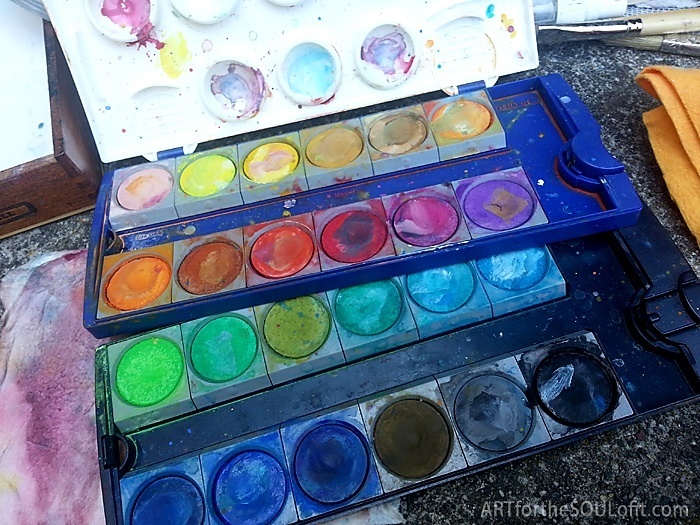 I had a piece of plexiglass cut to fit my pochade box, perfect for mixing my gouache paints and cleans up easily. 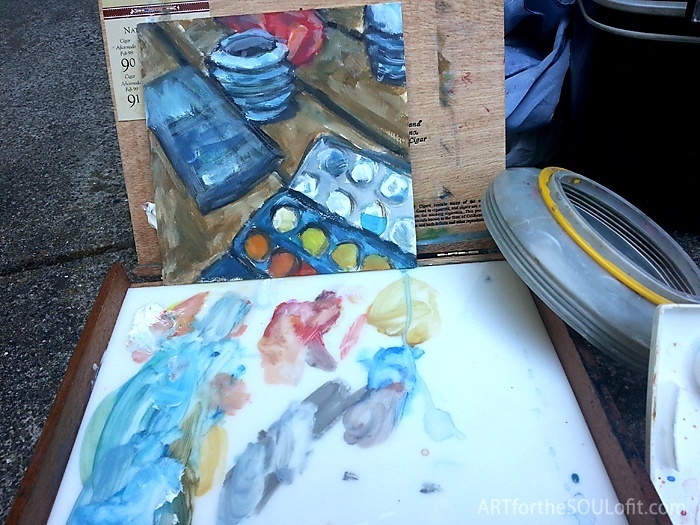 In last weeks Art Tip I shared about my plein air adventure and the cool cell phone apps I used for my viewfinder.